Sorry it's been such a long time since I posted anything new, but at least I have kept you waiting for something good! Last week was of course Children In Need and for the first time ever I decided to get creative and try and raise some money for the charity. I asked round in work if people would be interested in having a bake sale all week and I got a brilliant response! Quite a few people were keen on baking something, while a majority were unsurprisingly happy to eat the treats and donate. And no one was left disappointed! On the first day I brought in gingerbread men, cut with my new gingerbread men cutters which I got for my birthday. I loved how they looked but unfortunately a few things went a little wrong. I made baking error 101 - I got distracted by the X Factor results and I let my second batch of biscuits burn slightly. Then my raisins, which I used to make the buttons didn't stay in place, and last but not least I tried to make a piping bag to ice the biscuits but instead I pressed it too hard and it exploded all over the place, leaving my gingerbread men a little naked and a little boring. So, as you can tell I was a little disappointed by the outcome. However, they seemed to go down quite well in work so as long as the charity gained that is all that mattered! Now, I can't take all the credit for raising lots of money for Children In Need, lots of lovely people from work put in the elbow grease and got baking. On the first day, not only did I provide gingerbread biscuits but my colleague Ed made scrummy banana and fudge biscuits from the Dan Lepard book which went down very very well! On Tuesday another lovely colleague Kat, made chocolate brownies, and although I wasn't in work on the day to try them, my boyfriend had one and thought they were delicious! And so the week continued... Caroline made heavenly lavender cupcakes, Joel made amazing Portuguese custard tarts, Helen made adorable teeny tiny mini cupcakes and Charlotte made a loaf of very tasty bread! 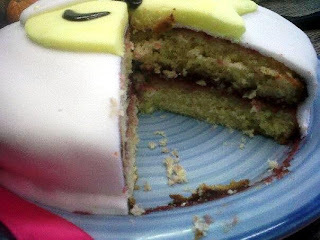 When I first came up with the Children In Need bake sale the first baking idea I had was that I wanted to bake a cake. I had recently bought some cake tins, which obviously needed using, and I had also never attempted to bake a cake before, so this was my best opportunity. And I was over the moon with what I made! It was a traditional Victoria sponge cake from the Great British Bake Off book I got for my birthday with a little Pudsey twist! I won't bore you with too many details but I can't describe how happy I was when I made it! From making the sponges to the raspberry filling and finally the Pudsey design of icing, thankfully nothing went wrong! The whole process took 4 long hours but hopefully you will agree from the picture that it was worth it! The sponge was nice and light, the icing didn't dry out and most of all my creativity actually worked!! The only issue I had with it at work was that I think people didn't want to cut a slice of cake, because they didn't want to ruin Pudsey's face! In the end, with all the bakers contributions and all the other lovely friends from work digging deep into their pockets and eating all the treats, I am very happy to announce that we made £68. 48 for Children In Need!! I am so grateful for everyones hard work and I am ecstatic for the money we raised for such a good cause! You too can still donate by clicking on any part of this blog that says Children In Need as it will take you to the charity's donating page!